ProForm elliptical trainers are marketed by Icon Health & Fitness Inc., which Funding Universe cites as the “world’s largest manufacturer and marketer of home fitness equipment.” As of February 2013, ProForm offers elliptical trainers on its website ranging from $599 to $999, covering the entire quality range for mid-level ellipticals. Like all elliptical trainers, there may be times when the electronic display of the machine encounters problems and makes using the equipment difficult. When using a ProForm elliptical, you may notice the electronic display console failing to turn on when powered up. You may also experience the readout growing dim and becoming difficult to see while the machine is in operation. Another common problem is for the workout feedback to become inaccurate. Higher-quality ProForm elliptical machines give you readouts for distance, calories burned, heart rate and workout time among other features. If this feedback is inaccurate, it can make achieving a complete workout more difficult. Problems with the display on your elliptical trainer are most readily identified visually. Look for a difficult-to-read display or one that is displaying abnormal characters. If you think the display is giving incorrect feedback on your workout, stop exercising and start a new program. Work out for a set time at a consistent rate and check the figures displayed on the console against your own manual calculations for accuracy. For example, if the heart-rate feedback is inaccurate, count your pulse manually with a stopwatch. According to the equipment manual included with ProForm elliptical trainers, low battery power is the most common cause of errors in the display console. If the display will not power up, you should check the power cable of the machine to ensure it is plugged into the wall. Corrosion on the electronics cables may also cause errors in the readouts or the display console’s ability to power up. 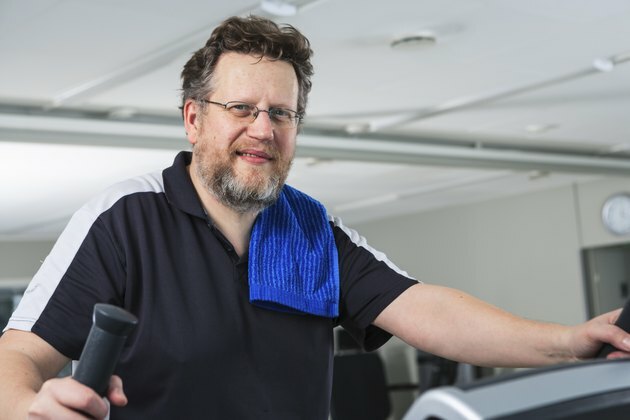 If you encounter an error with your ProForm elliptical trainer’s console, turn the machine off and then turn it back on to see if the error continues. If the problem persists, open the tab on the battery covering and replace the batteries. ProForm display consoles require five 1.5V D batteries. The batteries must be oriented in the correct manner for the machine to turn on. For issues with the console’s readouts, you may need to remove the plastic coverings around the flywheel and reorient the magnet on the flywheel over the reed switch. While your ProForm elliptical will still work even when the display console is not functioning properly, you will not be able to get a quality workout. The console controls the resistance and time of your workout, and fixing it immediately guarantees you will not be shorting yourself on calories you could be burning.